On this solemn feast we are called above all to faith in the fact (as revealed by the Lord Himself) that the Eucharist, the Holy Communion of which we partake, is in fact a reception of the very Body, Blood, Soul, and Divinity of Jesus Christ, whole and entire, in His glorified state. We do not partake of a symbol; the Eucharist is truly the Lord. Neither is it a “piece” of His flesh; it is Christ, whole and entire. Scripture attests to this in many places. And he took bread, and when he had given thanks he broke it and gave it to them, saying, “This is my body which is given for you. Do this in remembrance of me.” And likewise the cup after supper, saying, “This cup which is poured out for you is the new covenant in my blood” (Luke 22:19-20). The cup of blessing which we bless, is it not a partaking in the blood of Christ? The bread which we break, is it not a partaking in the body of Christ? (1 Cor 10:16). They recognized him in the breaking of the bread. (Luke 24:35). For anyone who eats and drinks without recognizing the body of the Lord eats and drinks judgment on himself. (1 Cor 11:29). I am the living bread which came down from heaven; if any one eats of this bread, he will live for ever; and the bread which I shall give for the life of the world is my flesh. (John 6:51). This last passage is a profound theology of the Eucharist from Jesus Himself. He makes it clear that we are not to think of the Eucharist as symbolic. As Jesus spoke the words saying that the bread was His flesh, the Jewish people grumbled in protest. Jesus did not seek to reassure them or to say that He was speaking only symbolically. Rather, He became even more adamant, shifting His choice of words from the polite form of eating, φάγητε (phagete, meaning to eat), to the impolite form, τρώγων (trogon, meaning to munch, gnaw, or chew). So insistent was He that they grasp this, that He permitted most of them to leave, no longer following in His company due to this teaching (cf Jn 6:66). Yes, the Lord paid quite a price for His graphic and “hard” teaching (Jn 6:60). Today, He asks us, Do you also want to leave me? (Jn 6:67) We must give our answer each time we approach the altar and hear the words, “The Body of Christ.” It is at this time that we respond, “Amen,” as if to say, “Lord, to whom shall we go? You have the words of eternal life” (Jn 6:68). Would that people grasped that the Lord Himself is truly present in our Churches! Were that so, one would never be able to empty our parishes of those seeking to pray with the Lord. As it is, though, only about 25% of Catholics attend Mass regularly. This is more evidence of the “narrow road” and of how few there are who find it. Two thousand years ago, Jesus experienced that most left Him; many today continue to leave Him (or stand far away), either through indifference or false notions. What father would not be alarmed if one of his children stopped eating? Consider, then, God’s alarm that many of us have stopped eating. This is where the “Unless” in the title of this post comes in. When I was young I thought of Mass and Communion as just something my mother made me do; it was just a bunch of rituals to me. I never thought of it as essential for my survival. Jesus teaches something very profound in John’s Gospel today. In effect, He says that without Holy Communion, the Eucharist, we will starve and die spiritually. Here is what Jesus says: Unless you eat the flesh of the Son of Man and drink his blood, you have no life in you (John 6:53). As a child and even as a young adult I never thought of Holy Communion as essential for my life, as something that, if not received regularly, would cause me to die spiritually. It makes sense, though, doesn’t it? If we don’t eat food in our physical life, we would grow weak and eventually die. It is the same with Holy Communion with respect to our spiritual life. Remember in the Book of Exodus that the people in the desert were without food and feared for their lives. In response, God gave them bread from Heaven called “manna,” which they collected each morning. Without eating that bread from Heaven, they would never have made it to the Promised Land; they would have perished in the desert. It is the same with us. Without receiving Jesus, our Living Manna from Heaven, in Holy Communion, we will not make it to our Promised Land of Heaven. It is not just a ritual; it is essential for our survival. Don’t miss Holy Communion! Jesus urges you to eat. A number of years ago, a mother and father in my parish noticed that their daughter wasn’t eating. They wasted no time in taking her to a doctor, who diagnosed the problem and prescribed the remedy. Those parents would have moved Heaven and Earth to get their daughter eating again! It is the same for God. Jesus urges us to eat, to receive Holy Communion every Sunday. Jesus urges us with this word: “Unless.” Holy Communion is our required food. One of the common, mistaken notions about the Eucharist is confusing this sacred meal with the table fellowship Jesus had with sinners. He was known to “welcome sinners and eat with them.” Holy Mass, however, is not one of those sorts of meals. The Last Supper, at which the essential reality of the Mass was first set forth, was held in the context of the Passover. Passover was a sacred meal shared within the family. Therefore, Jesus celebrated that Last Supper with the twelve Apostles. This lack of understanding of the difference between the sacred meal of the Eucharist and common table fellowship leads many to misconstrue the Eucharist; it also helps to explain the Church’s stance. Again, however, this is not what the Last Supper was. Jesus celebrated the Mass in the context of the Passover. Such meals presupposed that the people gathered together were family. This was an intimate meal celebrated in the context of faith, however weak or strong, but a faith that was presupposed. Jesus said to them, You are the men who have stood by me in my trials (Lk 22:28). This is one reason that the Church has always limited the reception of the Eucharist to those who are initiated, who are “members of Christ’s Body” through faith, and who keep communion with His Body the Church through assent to her teachings, remaining members of His Body by being in a state of grace. Let a person examine himself, then, and so eat of the bread and drink of the cup. For anyone who eats and drinks without discerning the body eats and drinks judgment on himself. That is why many of you are weak and ill, and some have died (1 Cor 11:28-30). Here, too, we see that the Mass is not akin to the table fellowship that Jesus at times kept with sinners. Rather, it is a sacred meal that presupposes membership in Christ’s Body through faith and the forgiveness of all serious sins that might have severed that communion. Holy Communion is meant to strengthen a communion that already exists. Thus, our “Amen” before receiving Holy Communion is not a lie, but is consonant with the reality of existing communion. I will write more on this topic in the coming week, but for now simply note that our reverence for Holy Communion requires us to receive worthily, in a state of grace that has preserved the communion we celebrate. Further, to receive worthily also requires that we have the faith of the Church, the Body of Christ, and keep communion by a belief in conformity and communion with it. On this Solemnity of the Body of Christ we are summoned to deepen our faith in the Lord, present in the Eucharist and acting through His Sacraments. Routine may have somewhat of a dulling effect, but it cannot be so much so that we receive the Lord of glory in any way that could be called mindless or lacking in the reverence we ought to have for Him. Ask the Lord to anoint your mind so that you never forget your need for the Eucharist. Unless! Unless you eat the flesh of the Son of Man and drink His Blood, you have no life in you (cf Jn 6:53). However, receive this great gift worthily and with a communion that befits the Holy Communion to which we are summoned. In many places this Sunday, the (moved) Solemnity of the Most Holy Body and Blood of Christ Our Lord is celebrated. While you may puzzle over my title for today’s blog, allow me to delay the explanation to a bit later. On a solemn feast like this, many things might be preached and taught. Let’s look at three areas for reflection: the Reality of the Eucharist, the Requirement of the Eucharist, and the Remembrance of the Eucharist. 1 Cor 10:16 The cup of blessing which we bless, is it not a partaking in the blood of Christ? The bread which we break, is it not a partaking in the body of Christ? Luke 24:35 They recognized him in the breaking of the bread. 1 Cor 11:29 For anyone who eats and drinks without recognizing the body of the Lord eats and drinks judgment on himself. John 6:51 I am the living bread which came down from heaven; if any one eats of this bread, he will live forever; and the bread which I shall give for the life of the world is my flesh. This last quote is from the Gospel for today’s feast. The passage is a profound theology of the Eucharist from Jesus Himself. He makes it clear that we are not permitted to think of the Eucharist as a symbol or in metaphorical terms. When Jesus referred to the bread as His flesh, the Jewish people hearing Him grumbled in protest. Jesus did not seek to reassure them or to insist that He was speaking only symbolically. Rather, He became even more adamant by shifting His vocabulary from the polite form of eating, φάγητε (phagete – meaning simply “to eat”) to the impolite form, τρώγων (trogon – meaning “to munch, gnaw, or chew”). So insistent was He that they grasp this that He permitted many to leave Him that day, knowing that they would no longer follow in His company due to this very teaching (cf Jn 6:66). Yes, the Lord paid quite a price for this graphic and “hard” teaching (Jn 6:60). If only everyone would grasp that the Lord Himself is truly present in our churches! Were that so, one could never empty our parishes of those seeking to pray with the Lord. As it is, though, only 27 percent come to Mass regularly. This is more evidence of the narrow road and how few there are who find it. Just as most left Jesus then, many continue to leave Him now or stand far away through indifference or false notions. What father would not be severely alarmed if one of his children stopped eating? Consider, then, God’s alarm that many of us have stopped eating. II. The Requirement of the Eucharist – When I was a young boy I thought of going to Mass and receiving Communion as just something my mother made me do; it was just rituals and stuff. I never thought of it as essential for my survival. But in John’s Gospel today, Jesus teaches something very profound about Holy Communion (the Eucharist). In effect, He says that without Holy Communion we will starve and die spiritually. As a kid and even a young adult I never thought of Holy Communion as essential for my life, as something that, if not received regularly, would cause me to die spiritually. But it makes sense doesn’t it? If we don’t eat food in our physical lives, we grow weak and eventually die. It is the same with Holy Communion. Remember this from the Book of Exodus: the people were without food in the desert and they feared for their lives, so God gave them bread from heaven, “manna,” and they collected it each morning. Without eating that bread from Heaven they would never have made it to the Promised Land; they would have died in the desert. It is the same with us. Without receiving Jesus, our living manna from Heaven, in Holy Communion, we will not make it to our Promised Land of Heaven! I guess it’s not just a ritual after all. It is essential for our survival. Don’t miss Holy Communion; Jesus urges you to eat. A mother and father in my parish recently noticed that their daughter wasn’t eating enough. Within a very short time they took her to the doctor, who was able to cure the problem; now the young girl is eating again. Those parents would have moved Heaven and earth to make sure that their daughter was able to eat. It is the same with God. Jesus urges us to eat, to receive the Holy Communion, every Sunday without fail. Jesus urges us with this word: “Unless!” Holy Communion is our required food. Remember how for forty years now the LORD, your God, has directed all your journeying in the desert … and then fed you with manna (Deut 8). Do not forget the LORD, your God, who brought you out of the land of Egypt (Deut 8:24). Do this in remembrance of me (1 Cor 11:24, inter al). What is remembrance and why is it important? In effect, to “remember” is to have present in your mind what God has done for you so that you’re grateful and different. God has saved us, made us His children, and opened Heaven for us. Yet our minds are very weak and too easily we let this slip from our conscious thoughts. Thus, the summons to an ἀνάμνησιν (anamnesin) or “remembrance” that is so common in the Eucharistic liturgy is a summons to our minds to be open to and powerfully aware of what the Lord has done for us. Don’t just stand or kneel there, forgetting; let this be present to you as a living and conscious reality that transforms you! How do you receive Holy Communion? Do you mindlessly shuffle along in the Communion line in a mechanistic way or do you go up powerfully aware of Him whom you are about to receive? Do you remember? Do you have vividly present in your mind what the Lord has done for you? Are you grateful and amazed at what He has done and what He offers? Or are you just like a mouse, mindlessly receiving something that has been put into your mouth? Some people put more faith in Tylenol than they do in the Eucharist. Why? Because when they take Tylenol they actually expect something to happen! They expect the pain to go away, for there to be relief and healing. But when it comes to Holy Communion, they expect next to nothing. To them, it’s just a ritual. Hey, it’s time to go up and get the wafer (pardon the expression) now. Really? How can this be? Poor catechesis? Sure. Little faith? Sure. Boredom? Yes, indeed. On some level it can be no better than a mouse eating a host. We are receiving the Lord of all creation, yet most expect little. Jesus is more powerful than Tylenol, and we are men (and women), not mice. On this Solemnity of the Body of Christ, we are summoned to deepen our faith in the Lord, present in the Eucharist and acting through His Sacraments. Routine may have dulling effects, but we cannot let it be such that we receive the Lord of glory each Sunday in any way that would be called mindless. On the Feast of Corpus Christi, we do well to mediate on the desire of the Lord to feed His people and the shocking indifference many have to this fact. This indifference is not just on the part of those who do not come to Mass; it is also found among those in the pews, many of whom don’t seem to care that so many people no longer attend. We should recognize the passionate concern the Lord has to feed all His people—yes even your wayward spouse or child. Let’s consider today’s Gospel in three ways. The diagnosis here is that the crowd is hungry. And this is a diagnosis of the human condition in general: we are hungry. How are we hungry? Let us count the ways. We are a veritable sea of desires. We desire food, drink, life, health, honor, respect, popularity, intimacy, family, security, goodness, beauty, truth, serenity, justice, and so much more. Yes, we have so many desires; we are hungry. And herein lies an insight for evangelization. For Somehow amidst all this hunger, God is calling us. We are like the woman at the well, who came thirsty for the water of this world but was shown by the Lord that she actually desired Him, and that it was only He who could satisfy her. It is sad that while every advertiser on Madison Avenue knows how to tap into people’s desire and draw forth loyalty, we Christians have so little insight. For the people of this world are more shrewd in dealing with their own kind than are the people of the light (Lk 16:8). So the diagnosis is clear: the crowd is hungry. Sadly, though, the Apostles in that moment were “out to lunch.” They were out of ideas. This could describe us today as well. II. Directive for the Disciples – Note that the Lord has a deep desire to feed these people. He said to them, “Give them some food yourselves.” The Apostles, of course, can only protest the impracticality of such a thing. They are staring right in the face of Jesus Christ yet think it impossible to feed this crowd. They see only five loaves and two fishes; they can’t see Jesus. They don’t know Jesus! Do you see their lack of faith? What about yours? Yes, this is also a picture of many in the Church today, who think that nothing can possibly be done to reverse the cultural decline or bring people back to the Church. They see only our meager five loaves and two fishes and forget that we have Jesus, who is still in the business of working miracles. Yes, the Lord has a deep desire to feed us. Consider the following: What loving parents, noticing that their child had stopped eating, would not move Heaven and Earth to find out why and to get them back to eating saving food? Yes, they would go emergency rooms and doctors’ offices until their child began eating again. Why is this not so with our Eucharistic food? Clearly the Lord deeply wants to feed us. So then why aren’t we as desirous to be sure that others, especially our children and family, are receiving the Lord? III. Determination to Deliver – The text says the following of the disciples: They did so and made them all sit down. Then taking the five loaves and the two fish, and looking up to heaven, he said the blessing over them, broke them, and gave them to the disciples to set before the crowd. They all ate and were satisfied. And when the leftover fragments were picked up, they filled twelve wicker baskets. Note well that the Lord is determined to feed these people; and He insists that His disciples help him to do it. They are expected to gather the faithful and make them sit down in groups of fifty. Then the Lord—the Lord Himself—blesses and multiplies the food. But once again, He has the disciples help. He gives the food to His apostles, but they set it before the crowd. And this is the Church. Jesus is the Great High Priest of every Liturgy. It is He who takes our meager offerings and then multiples and transubstantiates them. But He works this ministry through His priests, and in an extended sense, through the whole Church. The Lord feeds His people, but He does so through others. It is the role of the Church to take what Jesus sets before us and then see that it is distributed to others in due season. On the Feast of Corpus Christi, we acknowledge that the Lord feeds us through His Body and Blood, but does so through the ministry of His priests and through His Church. Do we see this as central to our mission? 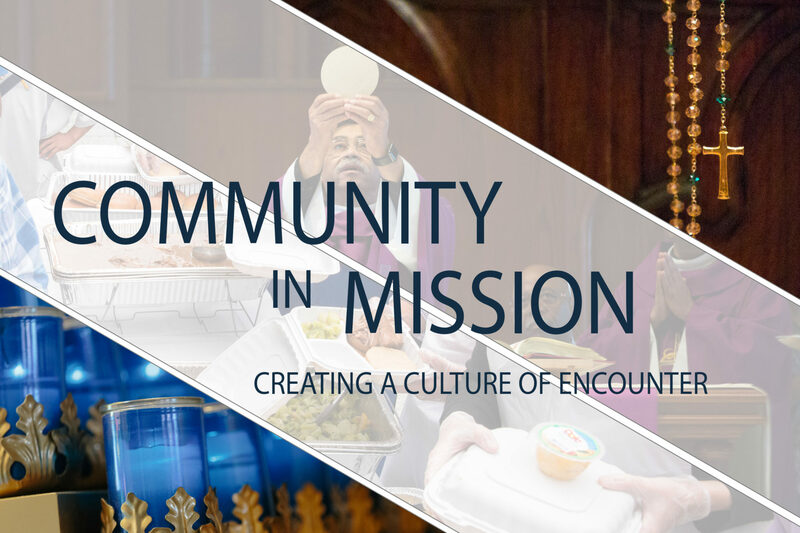 Is the Liturgy really at the heart of our parish life or are liturgies hurried so that we can get to our next activity on time? What is our highest priority? Is it the same priority of Jesus rooted in the deep desire he has to feed his people? The Gospel today says that they all ate and were satisfied. Does this describe the Liturgy at your parish? Are people fed? Do they experience an abundance at the Lord’s Banquet? Or is Mass merely something to be endured, something more akin to a flu shot, which is hoped to be as quick and painless as possible? Of course the Liturgy should be satisfying to God’s people. During the Liturgy, people should be instructed in God’s Word and then have that Word cause their hearts to catch fire with joy, inspiration, and, yes, conviction on the need for repentance. The faithful should expect and experience a great transformation on account of the Eucharist. How can someone fruitfully receive the Body of Christ and not experience great change and be satisfied? Yet, sadly, most people put more faith in Tylenol than they do in the Eucharist. When they take Tylenol, they expect something to happen: the pain to go away or the swelling to go down. Do people expect this of the Eucharist? If not, why not? On this Feast of Corpus Christi, please understand that the Lord wants to feed you and your loved ones. He wants to do this in order to save you and to satisfy you. Do you care about this? Is this a reality or just a ritual? Why not ask the Lord to engender within you the same desire that He has to feed others, and to make you a magnet to draw people to Him? Who are the “fifty” the Lord has put in your charge? Gather them and have them seated at Mass next Sunday.